Once again Illinois and California are neck-and-neck in the calculations for the worst of the worst U.S. states, this time in a measure of how friendly the states are for the growth of small businesses. Earlier this month thumbtack.com released its third annual survey of the climate for small businesses exploring such ratings as the overall friendliness of the state to small businesses, the ease of starting a business, regulations, ease of hiring new employees, taxes, and other criteria. The poll was conducted among over 12,000 small business owners across the country. The survey, held in conjunction with the Kauffman Foundation, found that the worst states for small businesses were California, Rhode Island and Illinois, all of which got a Thumbtack “F” rating. The next worst were Connecticut and New Jersey, both of which received a “D” grading. Illinois has descended in its rating each of the three years that the survey has been conducted having earned a “D+” in 2012, a “D” in 2013, and an “F” in 2014. The best states are unsurprisingly Utah, Idaho and Texas. Also getting high ratings in the poll were Louisiana and Virginia–the latter undoubtedly because it is now inextricably linked to the largess of the federal government. Texas, Utah, and Idaho have appeared at the top of the list in each of the three years the survey has been conducted. Thumbtack.com is a website launched in 2009 that helps people connect with local service providers such as painters, plumbers, small contractors, and the like. 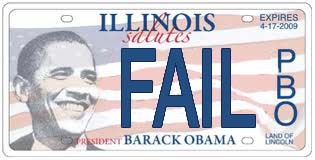 So, we have to hand it to the Illinois Democrats and their weak sisters in the feckless Illinois Republican Party. You folks have done a great job utterly destroying one of the greatest states in the union. Great job to the dictator Michael Madigan, the hapless and ignorant Governor Pat Quinn and the rest of the worthless set running the state into the ground.